The ‘Brides getting ready’ shots will be some of the first photographs you’ll take on the day of the wedding, and they can be fairly difficult. So, here are some tips to help you go into taking these photographs with confidence. Whilst a Brides getting ready, the first difficulty you’ll encounter with most weddings is finding decent lighting in the rooms where the bride and groom are getting ready. Many times they aren’t very well lit rooms, and even if they are, the color of the light can cause white balance issues. This leaves you with a few options. You can raise your ISO and deal with the color issues in post, you can use a flash and do your best to bounce or soften the light from it, or you can make the most of any available natural light, test some different light directions with your assistant, to see what works best.. The last option will only be useful if you have access to natural light (i.e.- windows and a fairly bright day), but it will give you the best results. If you can use natural light, do what you can to pose your subjects near it, sometimes people say not to shoot with backlight, but the image below is shot by exposing for the Bride and allowing the window light behind to over expose. When it comes to taking the shots of Brides getting ready; you’ll be just one of multiple professionals in the room. 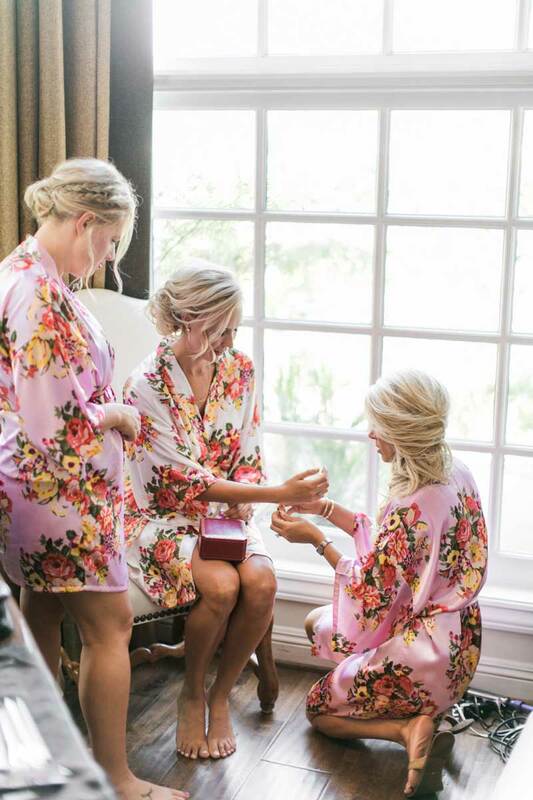 You’ll likely be sharing the space with a hairdresser, perhaps a makeup artist, or at least a few of the bride’s close friends that are taking on those rolls. Do what you can to work with them. Pay attention to what they’re doing, discuss where they’ll be working so that they can do what they need to and you can get the lighting you need. If you take some time to look through other photographer’s images of Brides getting ready, you’ll tend to see a few different perspectives repeated over and over. One of these is a view looking down from above your subject. This bird’s eye view gives you a good look at all the chaos going on around your subject as they prepare for such an important day. Another type of shot you’ll see quite a bit of is the mirror/subject’s perspective shot. These shots do a great job of putting the viewer in the shoes of the bride or groom, and can capture a lot of pre-ceremony emotions. Finally, and probably the easiest of these three, is the silent observer/fly on the wall perspective. Basically, you choose a corner away from the action and just try to capture the moments that occur while wedding party is getting ready. Again, this is great for emotional moments between the couple and their loved ones; and another way to capture all the action that goes on at this time in the wedding day. Whilst the Brides are getting ready, try to be creative with you composition, use doorways, shoot through windows, I like to mix between shooting simply and spending a little time being creative too. Try to step back and think to yourself 'what would look good', or maybe 'how could I make this more interesting'. Black and white Bridal portraits also can look great in the collection you deliver and can also make photograph taken in difficult light look great. Capture the small details of Brides getting ready. 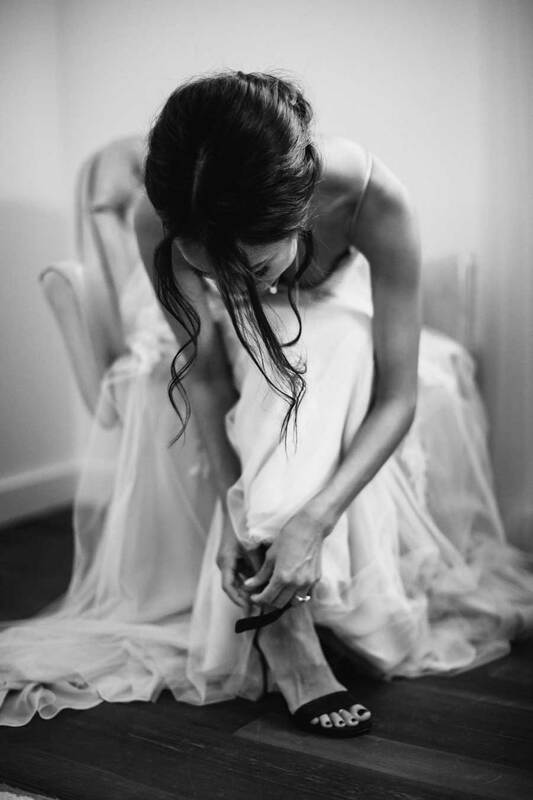 like the Bride putting on her shoes. Maybe ask her Mother or a good friend to help her. And don't be afraid to ask the Bride to move to a different chair or too a place in the room that has better lighting, they will appreciate it and images will be much better for it. Try some vertical shots, some wide shots, and maybe a few in close. Play with your angle A little too until you feel the composition is just right. When the Bride is getting ready, get some shots of her putting on her jewelry, again if the light is very difficult, ask her to give to a window, and don't be afraid to ask her to rotate a little until the light is perfect for you. Great communication and rapport with the bride is very important. When you are relaxed and confident, she will be much more at ease and it will show in your Bridal portraits. Photo credit: All images in this blog post by Lukas Griffin.